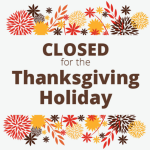 The Metropolitan Sewer Subdistrict, dba MetroConnects, will be closed from 12 p.m. Wednesday, Nov. 21, 2018 through Friday, Nov. 23, 2018 in observance of Thanksgiving. Our offices will reopen at 8 a.m. on Monday, Nov. 26, 2018. On behalf of the MetroConnects staff and commission, we wish you a safe and Happy Thanksgiving.